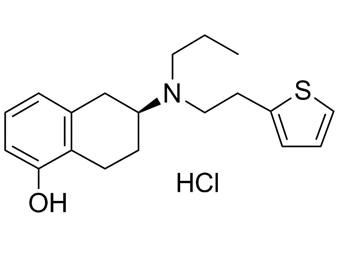 Rotigotine Hydrochloride is a dopamine receptor agonist with preference for D3 receptors over D2 and D1. As such, it is an effective anti-Parkinsonian agent. Racemic rotigotine is about 50 times as potent as quinpirole, the gold standard D2 agonist.
. Wood M, et al. Rotigotine is a potent agonist at dopamine D1 receptors as well as at dopamine D2 and D3 receptors. Br J Pharmacol. 2015 Feb;172(4):1124-35.
. Scheller D, et al. The in vitro receptor profile of rotigotine: a new agent for the treatment of Parkinson's disease. Naunyn Schmiedebergs Arch Pharmacol. 2009 Jan;379(1):73-86.